Carla and Ed Dickinson love many things about their penthouse condominium on the northwest Florida gulf coast, but what they most enjoy is that it was designed to be a beautiful, yet comfortable, family place where their children and grandchildren feel right at home. 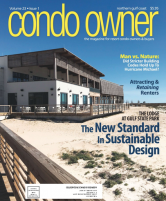 The couple had already owned property on the beach, but when they saw the layout of the central tower units in LaRiva, a luxury beachfront complex on Perdido Key, they knew it was just what they wanted. Because there is only one unit per floor in LaRiva’s center tower, each bedroom has its own balcony and the balcony overlooking the gulf is huge, Dickinson added. Additionally, she said the large living and dining area at the center of the 4,300-square-foot unit provides ample space for entertaining family and friends. Pararo, who has a background in architecture as well as design, was involved from the earliest stages. Explaining that his company bases all design decisions on “our understanding and interpretation of the client’s tastes and interests,” Pararo said it was also helpful to have a prior relationship to the Dickinsons. “We already knew a lot about this wonderful family from other projects we’d done with them,” he said. In planning the use of the condo’s interior space, Pararo said he took into consideration that all beach-related water activities at La Riva take place on a separate pool, spa and beach level. This allowed the Dickinsons to have a traditional tone to the home, even though it was a beach retreat. “We suggested an inviting, atypical getaway, with a Mediterranean feel, featuring carved wooden details, iron, stone or stone-like accents and antiqued wooden finishes.” he said. Pararo said that architectural elements were a huge consideration for the unit’s interior design. A primary concern of the design was to maintain unobstructed ocean views, Pararo said. “We did this with good space planning, the proper placement of furniture, and by using open, graceful iron lighting features that you can see through, along with ceiling mounted fixtures and recessed lights,” he explained. He added that the private Elevator Lobby provided an opportunity to set the stage for the old world environment the Dickinsons sought. 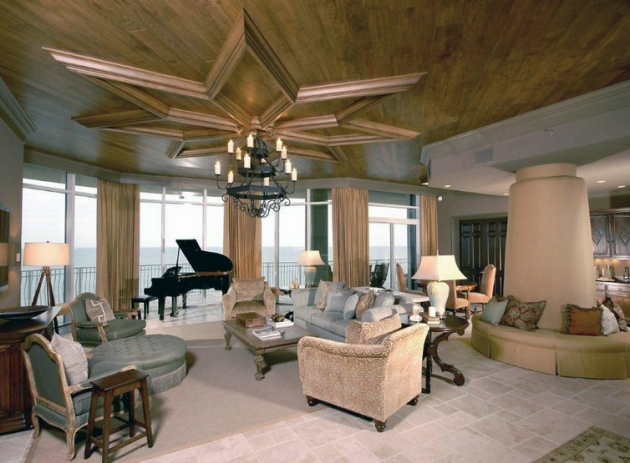 From the foyer, you step into an open living area with an enormous ocean view. To help define these spaces, Pineapple House added special architectural elements. A star-shaped medallion graces the great room ceiling and a massive support column was disguised by making it into a circular upholstered banquette, which also created multi-directional seating options. Pararo also designed deep crown molding that seamlessly becomes a valance, which supports and integrates traversing, full-draw drapery throughout the perimeter of the penthouse. “Draw drapery allows for privacy and greatly assists with targeted solar (heat) control at the beach,” he pointed out. With its many glass doors, walls and windows, the Dickinson’s penthouse condo has wonderful vistas, but the intense sun and reflective surroundings had to be addressed to prevent it from being too bright and too hot, Pararo said. In the bathrooms, ceramic tiles were used to impart the look of stone, while alleviating the use of that natural resource, Pararo said. Additionally, most floor coverings are quickly renewable, easy-to-clean hemp and sisal. To complete the look, Pararo created a color palette that incorporates shades of ocean blue and sand, expressed in lush textures and dusty fabrics. Most of the drapery and bedding are made from natural linens and cotton, while the upholstered pieces are covered in damask and velvet. “The cool fabrics contrast with the darker, faux-finished wooden walls, cabinetry and furniture, to help keep the environment’s abundant amount of natural light in balance.” he said. Dickinson said she and her husband could not be happier with the results of Pineapple Houses’ design, which reflects their love of the Italian and Mediterranean styles. Equally as essential, Dickinson added, Pararo and his staff provided the durability that makes it easy to relax and enjoy the space at the beachfront condo.